Nine Dead In Alabama After IV Treatment : Shots - Health News A pharmacy that produces intravenous solutions is the potential common source for an outbreak of blood infections that has sickened 19 people at six hospitals. The products have been recalled. 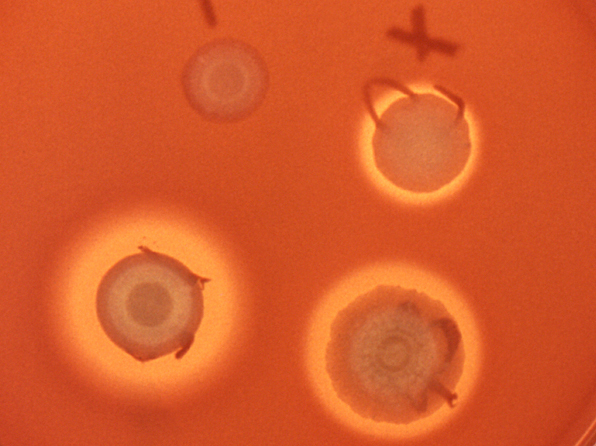 Colonies of Serratia marcescens dot an agar plate. Health officials are investigating an outbreak of a blood infections in 19 people hospitalized at six different institutions in Alabama. Nine have died, though all were already ill enough to require intravenous nutrition. Bags of IV solution contaminated with bacteria were the apparent source of the infections. The Alabama Department of Public Health said it first learned of the problem on March 16, when two hospitals in the state notified officials of patients with bloodstream infections. The cases of bacteremia were caused by Serratia marcescens, a germ that produces bright red colonies. The bacterium was identified and named in Italy in the early 1800s, after it was found to be turning polenta blood-red. A pharmacy called Meds IV that produced the total parenteral nutrition is the potential common source for the outbreak, health officials said. The pharmacy recalled the products and discontinued making more. Alabama's State Health Officer Dr. Donald Williamson told the media in a Tuesday briefing, "The risk of exposure, as far we know, has ended" because use of all IV products made by the Meds IV pharmacy has stopped. Williamson said it's not yet clear the bacterial infections killed the people who died. "I cannot ascribe those nine deaths to the serratia," he said, adding the people were already ill. The cases highlight the potential risks from products made by compounding pharmacies, which produce batches of custom-made drugs. While the medicines can be made properly under those conditions, past FDA testing of drugs made in the facilities have found quite a few to be either too strong or too weak. Separately, the FDA said Wednesday it wouldn't pursue enforcement actions against compounding pharmacies that make inexpensive hydroxyprogesterone caproate as an alternative to a pricey new version of the drug sold as Makena.